Trees are blooming, gardens are growing, birds are singing, and so are we. Patio season has arrived once more in Atlanta. Ready to get your al fresco on but not sure where to start? We have you covered. Here are four of our picks from Atlanta’s finest patios for eating and sipping your way from Spring through Summer noshing suggestions. Pretend you are sitting outside a tiny French bistro while seated in Inman Quarter. People flit by walking dogs, heading to yoga, or strolling to other restaurants. It’s a Parisian escape with a restrained French menu that changes with the seasons. And it’s always here when you need it - for breakfast, lunch, and dinner. If a brasserie has an iconic dish, it is probably steak frites. Tender, medium rare interior, crisp seared exterior, served with horseradish cream, herb salad, and a nest of salty, stringy fries. A cheese board with a baguette goes well with lolling in springtime weather. Match your mood with the concise wine list. Perhaps a Loire Valley rosé like the Rousse Frères Touraine Noble Joué that is light, delicate, aromatic, and refreshing - just like Spring. For a cocktail, the obvious (and delicious) choice is a French 75 with dry gin, lemon, and a topping of sparkling wine. 290 Elizabeth St. NE, Atlanta. 678-514-4536, bread-and-butterfly.com. A recent roof renovation at this Westside hideaway allows the patio to be enjoyed in all weather. There is a retractable roof and clear vinyl panels for when things aren’t so sunny and warm. It boasts one of the best views of the Midtown skyline and the atmosphere is hip and buzzy. Along with sushi rolls, nigiri, and sashimi, chef Jordan Smith has a menu full of small, shareable small plates that go well with patio relaxing. Share spicy rock shrimp tempura or his O-Ku karaage fried oysters with kimchi tartar sauce. Like the food, the bar program infuses cocktails with Japanese island-inspired ingredients like lychee, sake, and soju. In the East Meets Westside, there is a mixture of Japanese and rye whiskies, hoodoo chicory liqueur, sweet vermouth, and orange bitters. Spring kicks off official frosé season on the patio. 1085 Howell Mill Rd. Atlanta. 404-500-2383, o-kusushiatl.com. It’s kind of like a summer camp along Atlanta’s Beltline with various spaces to hang, play, people watch, and eat from a campfire-inspired menu. There are picnic tables, comfy chairs, and bar stools at the spot that sprawls with a little something for everyone. The menu is a downright trek through fun and smokey flavors. Begin with Trail Snacks like blistered avocado with crushed corn nuts. Move on to Campfire entrees and Base Camp shareables like spatchcock smoked chicken, grilled with onions, peppers, cilantro, and served with grilled corn, tortillas, and salsas. Salads are called Viddles and your meal finishes with a selection of Happy Trails. Hearty provisions that go well with friends. Seasonal patio punch comes in servings of 8 and 16, for when you know you are hanging out for a while (and have a ride home). This is the kind of place where Wild Heaven’s straightforward Emergency Drinking Beer feels right at home. For a cocktail, choose one that fits this place—like a Bee’s Knees with local Old 4th Ward gin, lemon, and honey. 684 John Wesley Dobbs Ave. NE, Atlanta. 404-458-6838, ladybirdatlanta.com. It’s tiny and beloved and nestled in the village of Oakhurst. It looks like a wee Irish Pub and there may be an Irish bartender pouring Guinness, but the food is hybrid bar food meets Mexican meets Asian. The patio is friendly and casual—the kind of place you want to sit for hours to not talk about politics. Check the chalkboard for specials and you will no doubt lament that you missed whatever has been recently crossed out. Chef Andy Gonzales knows what tastes great with beer and sunshine. Wings smoked on a Big Green Egg might be the scent that welcomes you in the door. Tempura fish and chips is a terrific standby if you miss out on the once a week ramen special. A local favorite is the Chines Breakfast—a bowl of jasmine rice, roasted pork belly, fried leaks, and a sunny side up egg on top. This is a spot for beer nerds, with an eclectic rotating draft list of about a dozen and a large selection of bottles from local craft brews to European ciders. There is no crazy long cocktail menu, just a couple of classics like a Brown Derby. They know how to make your drink. Trust us. 659 East Lake Dr., Decatur. 404-373-1116, steinbecksbar.com. Marc Taft’s Avalon “shack” sits in the center of the sort of quad area of Avalon. He calls it “Cape Cod meets Santa Monica” and that’s the feeling you get. The rooftop has a retractable roof to suit all sorts of weather. A walk-up window is quick and easy for strolling with snacks and drinks. 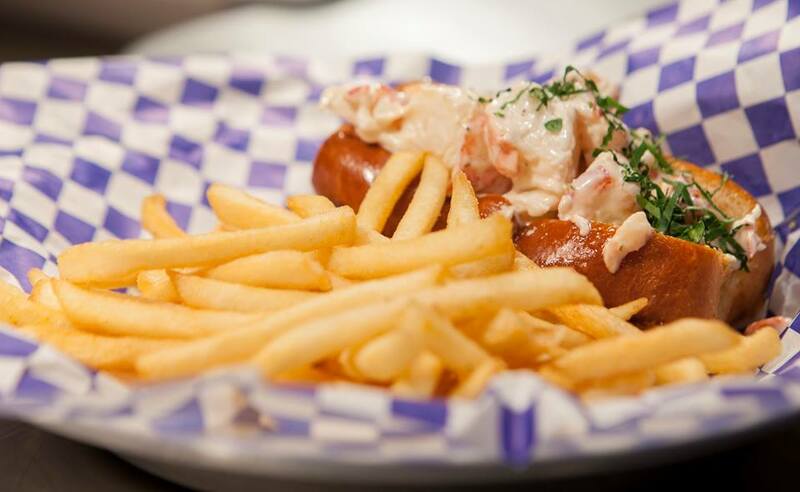 You get the best of both worlds here with piled high lobster rolls, chowder, and peel and eat shrimp as well as fish tacos with avocado and lime crema. Cap things off with a tangy slice of key lime pie to complete the vacation vibe they have going on here. The rooftop patio looks out over everything with tiki inspired cocktails. Sip on a boat drink, a Mai Tai, or take in the sights with a cone of soft serve ice cream. 700 Avalon Blvd., Alpharetta. 470-226-2190, brineseafoodshack.com.